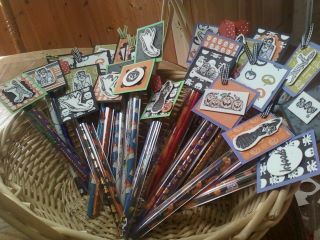 Halloween Pencil Treats $1 each!!! 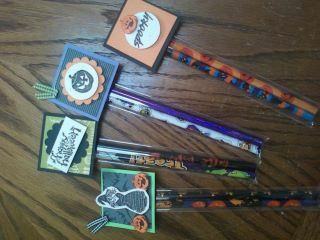 Cute little packages with 2 halloween pencils in each! They go perfectly with the bookmarks and candy treats that I have for sale below. Small Diaper Cakes Available to order!!!! 2 rows of diapers, baby powder, small figurine at top of cake. Decorations to suite your baby include: pacifiers, rattles, ribbon, etc. Diaper cakes are custom made to your order: girl, boy, pink, blue, yellow, green, etc. Also to match your theme: bears, elephants, sports theme, ducks, etc. Please allow me 1 weeks time to have your order ready. Shipping is available for $15. Local delivery in the Zephyrhills, FL area. Here is a collection of some of the Halloween Bookmarks that I have made for the craft sale. I haven't decided how much to charge for these yet. Here is a basket full of Halloween Goodie Bags ready for the craft sale. I am selling them for $1 each. Full of tootsie rolls or candy corn. And an assortment of styles for anyone! Hello stamping world!! Since moving to Florida and working full time, I have not been on here at all!!!! I have been crafting here and there, maing things for all my new co-workers and friends, and of course for my kids and their teachers. I will be doing a fall craft sale at my children's school next weekend and will be sharing with you all the cute little things that I am busily preparing for it! This card is going to be sent to my mom for Mother' Day, along with some of her favorite perfume. I can't wait until I live closer to her and get to celebrate Mother's Day with her again!!!! I used my new scalloped circle nesties for this card! They are so fun to play with. And they work in my Cuttlebug! 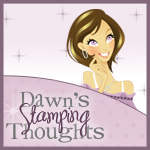 The image is from Whimsy Stamps~! Love them! I colored her in with my Stampin Up! markers. The paper is also Stampin' Up. The "with love" on the bottom was punched out with the word window punch. The little white strip of paper was embossed with my Cuttlebug and the Swiss Dots embossing folder. These are the Easter treats that we made for the kid's teachers this year. I think they all came out so cute! And they were so easy to make. I just used things that I allready had in a box in my closet, such as these cute little buckets! I made 3 for my youngest's preschool teachers. And then 4 each for my older two children. And then as they were getting ready to go out for the bus this morning, they all complained that they needed one more because they had 5 teachers to give them to! What! So I'm glad that I kept them simple and easy, because I was able to whip up a few more very quickly! I hope their teachers like them, and that they get them before the kids eat them all up! Hope you all have a wonderful Easter holiday with your families! Here are some little goodie bags that I made for my kiddos to take to school. These are the treats for all of their classmates. I will be sharing the teacher treats tomorrow. On a personal note, we have decided to move to Florida!!! We are so very excited!!! So that is why I haven't been up to blogging much lately. We have put our house up for sale, and will be moving as soon as it's sold. Hopefully soon! So we have been busy with getting the house cleaned up and ready, and I have been getting rid of a lot of stuff. I'm such a packrat, lol! Here's another card made for our family member. I'm thinking of getting him a bottle of gingerale and making a matching tag to tie around it. I'm not really sure what he likes to eat or munch on. Maybe I'll make him some cookies, everyone likes cookies right? For this card I used whisper white, soft suede, and bermuda bay. I really didn't like Stampin' Up!s in-colors, but I am making myself use them up! I really am getting a lot of use out of everything in my stash and not having to buy new things so much! I really have a lot of stuff, lol! We have a family member that is going to be going through some medical treatments for the next few weeks. So I have been busy making little treats and cards to share with him over the next month or so. For this card I used my markers to color in the tree and also stamped the Praying for you on the bottom. I used Whisper White, Old Olive, and Rich Razzleberry for my colors. I also used Soft Suede for the tree trunk and branches. The top corners have a little paper piercing, but it's hard to see in the picture. I also made a little bag topper that just says thinking of you, and filled it with hershey kisses to go along with this card.